If you have VisualBoyAdvance simply enter the Palace, activate the code 030038F0:20, and then deactivate it. You will now be past the fox. 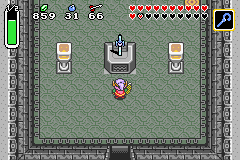 You can also download the 4 Swords Mastah Save with the requirements already completed to achieve the same result. 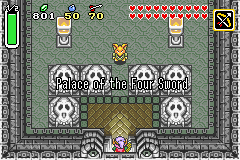 The Palace of the Four Sword is an all-new dungeon exclusive to the Game Boy Advance version. The entrance can be found in a new hole on the east side of the pyramid, to the right of a statue which blocks your path. You must access the hole by falling from the ledge above. 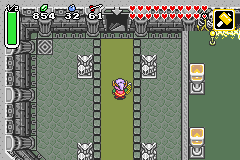 In order to gain entry to the Palace, you must first complete the Four Swords multiplayer adventure, in order to be considered a "true hero". Alternative methods of accessing the palace are described elsewhere on this page. 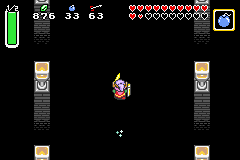 While you can enter the Palace as soon as you have beaten the Four Swords and have access to the Dark World, it is highly recommended that you play through as much of the game as possible before doing so, in order to obtain the maximum amount of health. It's also advisable to bring four Red Potions (or fairies at the very least). 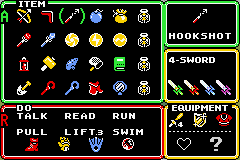 The minimum items needed are the Hookshot, the Flippers, the Cane of Somaria, the Magic Hammer and the Fire Rod. Watch how to get into the palace without doing the quest or using a device. Make sure to read the description. When you enter the Palace, you will be greeted by a typical Dark World thief, known as a Pikku. He will charge you an entrance fee of 20 Rupees, and he will charge you this fee every time that you come here, even if you've paid it before. Provided you meet the criteria for entry, he will allow you to pass. You must proceed from this entrance, through the hallway, and into the Grand Hall above. However, in the hallway waits six chained up Terubeans who can whittle your health down quite rapidly – even with Red Mail on – if you're not careful. It is possible, with a good running start, to safely dash up the left or right side of the hallway without receiving any damage, but this takes a little luck. Once you reach the grand hall, you are presented with four choices of doors, along with one magically sealed entrance at the top. 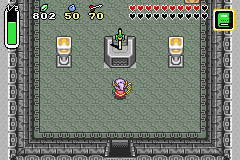 The entrance to the green sword can be found in the lower left corner of the Grand Hall. 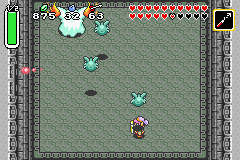 A few red Stalfos occupy that region of the room. The first, and only, test of the Green Sword is this Swamp Palace-inspired trap. Water flows from the top of the room in a rapid downward stream. Jumping in the water will prove futile as the current is simply too fast to overcome. A lone torch lies at the bottom of the room, seemingly without purpose. However, when it's lit, the force of the water dies down to the point where Link can actually make some progress against the current. Dive in quickly, as the current will resume its normal pace if the torch is allowed to go out. Along the trip through the water, you will encounter cannonballs, and a large spiked bar that floats up and down along the surface of the water. 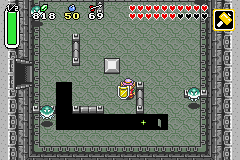 Link is permitted to dive underwater briefly in this version of the game, and that is precisely what you'll need to do in order to avoid being pushed around and back towards the bottom by these traps. Once you make it safely to the top, you'll need to swim towards the ladder on the left, in order to climb out of the water and proceed to the boss. Arrghus returns with an upgrade to his defense. Instead of being surrounded by harmless puffballs, Arrghus has convinced a pack of blue Baris to swarm around him. The big difference between the ordinary puffballs and these Baris is their ability to release electricity and hurt you as you try to attack them. These Baris are also different in that they are not harmed by the Hookshot; merely pulled along. There is good news, however. If a Bari is going to release electricity, it will do so immediately after being pulled over by your Hookshot. Therefore, you need only wait a moment to see if the Bari lights up before slashing it with your sword. If the Bari does not release electricity after it begins to float back to Arrghus, you are safe to slash and destroy it before it can complete the trip. Once all of the Baris are removed, Arrghus goes back to his old tricks, jumping up to the ceiling and trying to slam down on top of you. Along with Arrghus's tendency to slide around the room, he stirs up a lot more Kyameron bubbles to bounce around the room and attack you. In fact, if you fail to strike Arrghus within a certain time limit, he will stop, shake for a moment, and then whip up a near-constant stream of Kyamerons to attack you, so hit him as quickly as you can once he lands. Remember that he will try to land on top of you, so if you merely step out of the way just before he lands, you will be in a position to strike him as soon as he begins to move. Once Arghuss II is defeated, the door to the room above will open. Pass through it to find and claim the Green Sword. 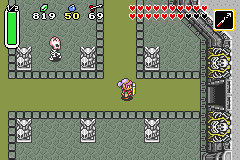 The entrance to the red sword can be found opposite the Green Sword entrance, in the lower right corner of the Grand Hall. More red Stalfos occupy that area. Simply defeat these enemies to proceed. When you enter this room, you will see four blue Baris and one red Pon in the center. Shortly after you spend a little time in the room, the outer section of the floor will begin to drop away, not unlike other dungeon rooms that you've experienced. 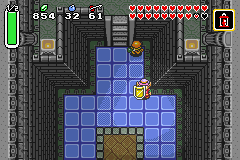 This room however, leaves one tile in place, allowing you to escape and re-enter the room at will. The shutter door at the top will remain locked until every enemy in the room is defeated. The strongest monster in the room, the red Pon, is probably the most easily defeated since you can push it into the gap in the floor. The remaining Blue Baris are easily defeated with the Hookshot. Don't worry about being unable to access the door above until the enemies are defeated. You can simply leave the room and return and have plenty of time to reach the door before your route is cut off by the falling floor tiles again. Only the fastest players can maneuver around these blocks in time. When you enter the room, the blocks are arranged such that you can't proceed due to the blue fence blocks. 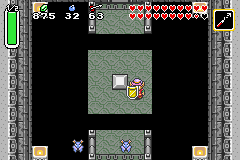 Obviously, you must trigger the Crystal Switch in the upper left corner to lower them. A Boomerang throw will suffice. Once the blue fence blocks are lowered, the blocks can be pushed and manipulated to provide you with access to the upper right corner of the room. Take care to remove the Pometto turtle before proceeding. Once you defeat it, you'll notice that you can't proceed thanks to the one orange fence block blocking your way. You must find a way to trigger the Crystal Switch so that you are north of the blue block when the switch is triggered. 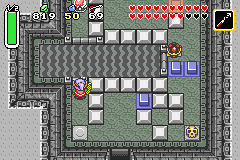 To do this, stand where Link is in the diagram to the right and use the Cane of Somaria to create a block, when you get past the blue fence block, then use the Cane again, the block will explode, the gate blocks will change and you can easily get through. The beginning strategy for defeating the second King Helmasaur is almost entirely the same as the first. He is a bit stronger now, and takes a lot more hits, both before and after his helmet comes off. However, he has a new trick up his sleeve: He will regenerate his helmet just once. After you hit him enough times in the crystal lodged in the center of his head, the protective helmet will return, and you will have to resume hitting it with your hammer to break it off again. Once you destroy it a second time, instead of a crystal, you will see a large eye that is very similar to one of the small Vitreous eyes. To defeat King Helmasaur, you must aim your arrows directly into the center eye. One Silver Arrow is enough to destroy the beast for good. After you shoot the central eye with an arrow, King Helmasaur II will be defeated. The door to the room above will open. Pass through it to find and claim the Red Sword. 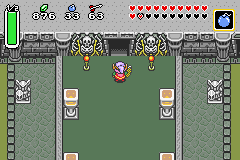 The entrance to the blue sword is in the upper left corner of the Grand Hall. A gang of Zahzaks, two red and one blue, hang out in that section. Watch out for these golden Octoroks. 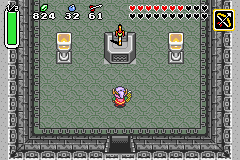 The first and longest section of the test for the Blue Sword is also probably the easiest. When you enter the dark room, you won't even have much of a chance to witness the unique Octoballoon, as it bursts before you get close. This leaves only two golden Octoroks on the lower icy level. Two torches to the left and right of the entrance can be lit to help you see the action. 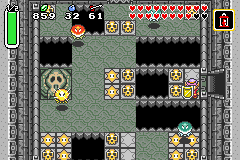 Once you climb down to the ice, dispatch the golden Octoroks as quickly as you can to make a ladder appear in the bottom of the room. Climb up to proceed through the door on the left. Don't destroy too many of the skulls. 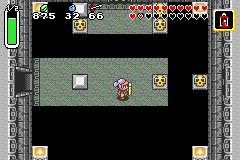 This room is inspired by the Star Tile puzzle that you encountered in the final part of the Skull Woods dungeon. The Baris that occupy the room are little more than a nuisance which can be dealt with by using your Hookshot. The Star Tiles present a bit of a challenge, and many players' first reaction is destroy all of the skulls. However, doing so will make progressing through this room very difficult. Your ultimate goal is to reach the skull in the lower left corner of the room. Under that skull is a pressure plate. If you possess the Cane of Somaria, you should be very familiar with pressure plates. Simply create a block on top of the plate, and step on the Star Tiles directly to the right of the plate. Then make your way to the now-open door at the top of the room without falling through any of the pits, or accidentally rearranging the room by stepping on the wrong Star Tiles. Most of the puzzle in this room is obscured by the upper level of this room. There is a blue fence block that starts out raised when you enter, and it keeps the blue fireball in place on the right side of the lower level. Hitting the Crystal Switch with a Boomerang lowers that block so that the fireball can proceed, but it raises the orange fence block which prevents you from exiting. Just as before, you'll need use the Cane of Somaria and all you will have to do is dodge the fireball. As before, just use the cane again to explode the block once you get past the blue fence block. Mothula has learned a few new tricks since you last fought with it. It has traded the moving floor and outlying spike traps for the ability to clone itself twice and attack you simultaneously with the clones. As a result, you must determine which moth is the true Mothula. When you strike the fake ones, they will instantly break apart into a collection of bees, which will proceed to attack you as long as they're around. 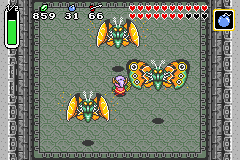 Once both clones have been turned into bees, Mothula wastes no time generating new clones to keep you confused. Only the true Mothula will flash gray when struck by your weapons and remain whole. Once you determine who the real Mothula is, stick with it and attack as frequently as you can, ignoring the clones entirely. Eventually, the real Mothula will succumb to your attacks. As soon as the true Mothula is defeated, the door to the room above will open. Pass through it to find and claim the Blue Sword. 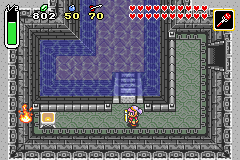 The entrance to the purple sword is found in the upper right corner of the Grand Hall. Another gang of Zahzaks can be found guarding the entrance. 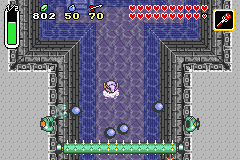 The first part of the purple sword test is comparatively simple to all of the other rooms you have faced. When you enter the dark room, light the torches to the left and right of the entrance so you can see where you're going. 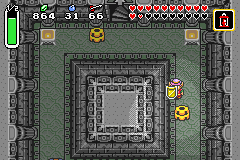 Be on the lookout for the original Like Likes from the first Legend of Zelda, as they can, and will eat your shield. You certainly can't afford to be without one at this point in time. Stay to the right side of the hallway (unless you feel like using magic power to don the Magic Cape and pass through the bumpers on the left), and enter the door in the lower right section of the room to continue. At first, this room may seem a little puzzling. With no reliable way to access any of the skulls in the outlying regions of the room, their purpose may not be clear. 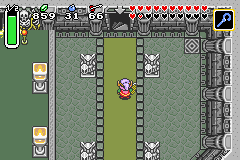 Like many of the rooms in this palace, this room exploits a change that has been made to the system of the game from the SNES version to the GBA version. 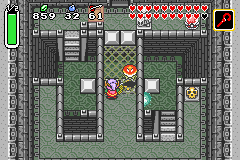 In this version of the game, arrows can be used to destroy skulls. If you test this out, you will find that a pressure plate has been hidden under the right-most skull of the room. With one mystery solved, the next becomes how to activate it. By using the Cane of Somaria, you can create blocks, but you may also pick up and throw the blocks that you create. Once the pressure plate is revealed, simply create a block and throw it to the right so that it remains situated over the plate and the shutter door above stays open. Now all you need to do is reach the door. If you destroy the skull below the north block, you can Hookshot over to it and make your escape. You must rely on an obscure trick to escape from here. When you arrive here, six bats wait in formation around a single block in the center of the room. The bats are easy to overcome, so take your time dealing with them until you have a clear path to the center. Reaching the lone block is a simple matter of using your Hookshot. Once you're on the island, however, there does not appear to be anything in the room that can help you escape. In truth, there is nothing. That ability lies in you. 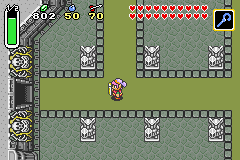 You may recall a room at the end of a bridge in Ganon's Tower that could only be accessed by dashing against a set of blocks so that you bounced off the wall and over a gap in the floor. That same technique must be used in order to reach the door up above. Stand above the block and begin dashing to the left or to the right. Just before you take off running, be sure to face down so that you ram into the block, and the force of the collision knocks you backwards to the platform above. Walk through the door and face the next boss. When you arrive in this room, you may be startled to see your Uncle sitting in the middle of the room, just as he was in the very beginning of the game when he was wounded. But alas, it is really the master of disguises, Blind the Thief, playing a cruel trick on you to lure you in. Once you are close enough, he reveals his true form once more. You will start out using the same strategy as before: striking his head with your sword. However, the first time you disconnect his head, his body rises without forming a new head. This time, his heads have a strange property: you can actually hit them with your sword. In fact, you can bat them around so that they eventually reconnect with his shoulders. After the first head is reunited, strike his head until two come off the body. Bat them both back into his shoulders. The first one will damage him, and the second will stick. Strike the head again, and now three will disconnect. As before, bat them back into his body. The first two will damage Blind, and the connection of the third and final head will destroy him. After taking down the master thief for the second time, the door above you will open. Pass through it to find and claim the Purple Sword. 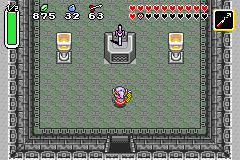 With all four swords in your possession, you may finally cut down the magical barrier that stands between you and the final entrance in the Palace of the Four Sword. As you approach the barrier, two Stalfos Knights will drop from the ceiling to attack, but you may safely ignore them. Strike the barrier with your sword and proceed through the door. On the other side, you will make your way to what appears to be a dead-end. However, a straight uninterrupted bridge lies directly in front of you, and you may walk forward without fear. Cross to the other side of the room, and pass through the door to face your destiny. 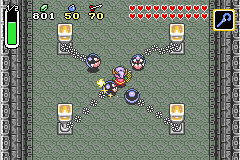 During the quest of the Four Sword, Link's body was fractured and separated into four distinct beings. In the process of succeeding in his mission to rescue Zelda from Vaati, Link is regarded as a Hero. In order to be considered a Master, he must now face and defeat each of the four portions of his own self, as they were created by the Four Sword. They will attack one at a time; first Green, then Red, then Blue, and finally Purple. With each passing color, they gain one additional move that the previous ones did not possess. The Green Link only knows how to dash. 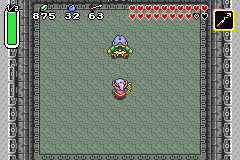 The Red Link can perform the whirling blade attack as well. The Blue Link can perform both of those moves as well as a downward stab attack. The Purple Link knows all these moves, and one more: the fire blade attack. As you fight and beat each one, the next one follows until all four Dopplegangers have been defeated. The swords rise and travel to their respective corners. The Purple Doppleganger is the strongest and knows every move. The swords return to acknowledge you as their master. Watch a video of the secret ending. Four one-on-one fights may seem long and tedious, but there are situations that you can take advantage of to make the fights a little easier. The first is after a Doppleganger tries to Dash attack you. It will collide with the wall and become stunned momentarily. This is an excellent opportunity for you to strike at it undefended. It is possible to lure the Dopplegangers into near-continuous Dash attacks and strike at them in retaliation. However, there's a more sure-fire technique that's a little more proactive. As a left-hander, when you face up, your sword swings wide to the left. When you stand face-to-face with a Doppleganger, your sword will likely slam harmlessly against its shield. However, if you stand more to the right of the Doppleganger while you face upward, instead of face to face, you sword will swing wide enough to strike the Doppleganger behind the shield, earning you a safe hit. What's more, the Doppleganger is likely to rush right back into the position it was in when you hit it so that you can continue to strike it from this location. Even though the Purple Link takes the most number of hits, with this technique, it's sure to go down with little struggle on your part. 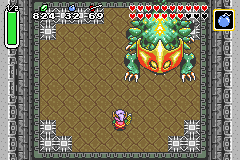 Just to be on the safe side, you can activate the Cane of Byrna for added protection during the final fight with the Purple Link. Once the final Doppleganger is defeated, the secret ending is yours to behold. 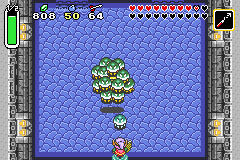 After you have defeated the Link clones you will be rewarded with the secret ending. This page was last edited on 1 March 2013, at 07:35.